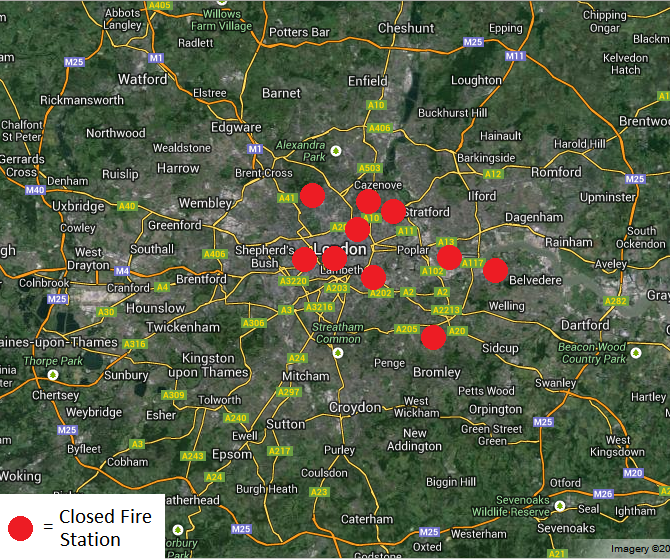 Along with the closure of these fire stations there is ongoing works being carried out on many other fire stations across London. The fire stations which are either undergoing rebuilding or is due to be rebuilt are: Dagenham, Dockhead, Leytonstone, Mitcham, Old Kent Road, Orpington, Plaistow, Purley and Shadwell fire stations. The London Fire Brigade has received £57.4 million from the Government in order to carry out the rebuilding of these fire stations while the London Fire Brigade are expected to make £50 million on the sell of the 10 fire stations. Boris Johnson claims that the closure of 10 fire stations and the dissmisal of 550+ firefighters will improve fire safety across London. He told his critics in the London Assembly to “get stuffed” when challeneged on the validity of his remarks. Will Boris Johnson have the blood of Londoners on his hands as a result of his cut backs on such a vital service? London’s oldest fire station closed its doors for the final time with emotional scenes set to a backing track of country music. London’s fire authorities expect to make £50m from the sale of 10 fire stations that will close today under cuts forced through by Boris Johnson. The controversial reductions, which include 14 fire engines and 552 firefighting jobs as well as the stations, have sparked an intense debate over their impact on response times and safety. Last-ditch demonstrations were expected on Thursday morning at Clerkenwell fire station, the oldest in Britain and one of those set to close, against cuts described as “reckless” by unions and the Labour party. James Cleverly, chairman of the London Fire and Emergency Planning Authority, insisted the cuts would not threaten safety. “Londoners will continue to receive one of the fastest emergency response times in the world from the London Fire Brigade. If you dial 999 and need a fire engine, we still aim to have one with you within six minutes and a second, if needed, within eight.” The fire authority said this week it would seek to put four stations on the market before the end of the month: Downham, Bow, Silvertown and Woolwich. It said other disposals would be subject to conditions such as planning permission. “This is a sad, sad day. Boris Johnson doesn’t know what he’s doing,” Badcock told those gathered outside. The devastating impact of the fire station cuts, enforced by London mayor Boris Johnson, was visible in the tears that ran down the cheeks of some of the capital’s toughest men, on their last shifts in their stations. Fire fighters embraced each other, squeezing hands and shoulders outside Clerkenwell and Westminster Fire stations on Thursday. Westminster station, which was opened in 1906, is closing along with nine others in the capital as part of a £29m cost cutting plan which involves the loss of 550 firefighters jobs and 14 fire engines. At Clerkenwell Fire Station, which at more than 140 years old is the oldest in the country, fireman Alex Badcock looked stricken as he walked out of the station gate, covering his mouth with his hands. He had worked there for 29 years. Colleagues who filtered out after him held each other tightly. The fire fighters had been forbidden from wearing their uniforms by bosses as they came out to greet supporters, holding a vigil outside the building. Protesters opposing the closure of 10 stations have demonstrated outside the oldest operational fire station in London. Clerkenwell fire station, dating back to the 1870s, and nine others, were closed earlier in a move by London Fire Brigade (LFB) to save £28.8m. LFB said changes, including the loss of 552 firefighters, were “inevitable” but the service would not be affected. But the Fire Brigades Union said the cuts would compromise public safety. Union members, local politicians and residents held the protest at Clerkenwell. Firefighter Alex Badcock, who had worked at the station for 29 years, broke down in tears and said: “It’s a sad, sad day. Boris Johnson [London’s Mayor] doesn’t know what he’s doing.” The Green Watch crew from Clerkenwell went out on its last callout at 06:05 GMT when it attended an incident in Oval Road, Regent’s Park. A crew from Belsize, also closing, also attended. Greg Edwards, a Fire Brigades Union (FBU) member, addressed the crowd outside after he left the fire station and lit a candle in honour of its 140-year-old history. One of the 10 shutting is Clerkenwell, the country’s oldest fire station, with members of the Fire Brigades Union (FBU) and councillors planning demonstrations outside this morning. The London brigade is also cutting 552 firefighter jobs and reducing the number of fire engines by 14 to help meet budget savings of £45 million over the next two years. Paul Embery, London regional secretary of the FBU, said: “Mayor Boris Johnson will have blood on his hands. It will be only a matter of time before someone dies because a fire engine did not get to them in time.